Salvation 'Dia De Los Muertos' thats the one with the bold colours in. Salvation 'Hard Day' is more on neutral side. 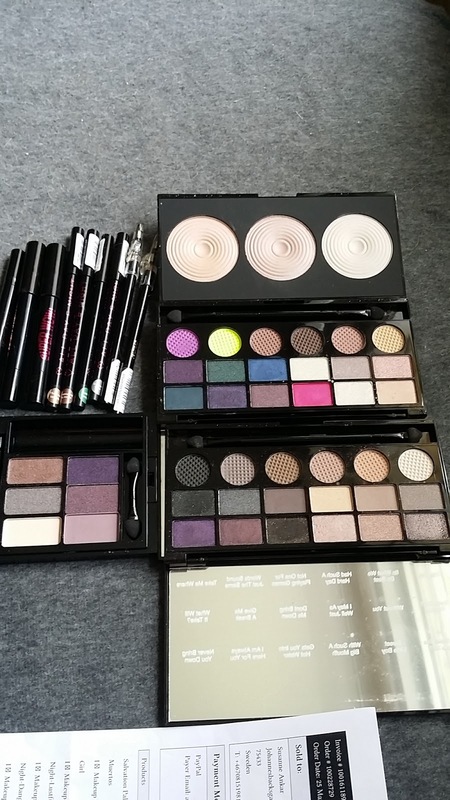 Both these palettes are amazingly good. The pigmentation is fenomenal and they are true to colour. There are only two shadows that lack a bit pigmentation, and that is the bold yellow and purple in the 'Dia De Los Muertos' palette. 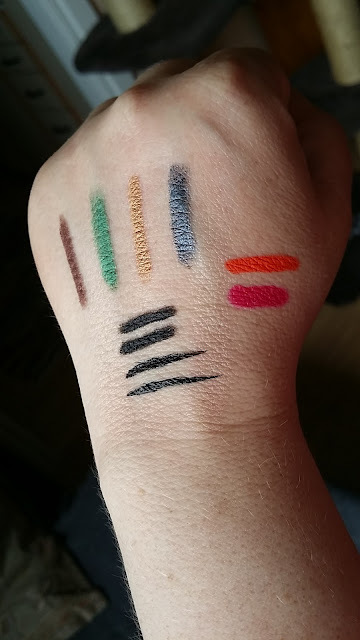 They are matte shadows and therefore you have to work a bit harder with them more then you do with the neutral matte and the shimmery ones. The highlighter palette 'Beyond Radiance' is pretty much a dupe for Hourglass 'Ambient Lightning' but with out the cost. The six shadow I ♡ makeup palettet 'I am powerful' comes with a lipstick, this one was dark red. And these shadows are pretty good, most matte but still one palette, that I would put in my bag if/when I go travelling. Ease to bring along and easy to have in the handbag for touch ups. 'Channeling my inner', which is a shimmery brown with a hint of golden red undertone. 'Lustful ways', is nice forest green. 'The Last Laugh', is golden bronze and really gorgeous. And the last of these eyeliners are 'Dangerous Games', is greyish blue and that too is really gorgeous. I got two traditional eyeliners, one in black and one black with silver sparkle. They are good but not as creamy and easy glide - on as the I ♡ Makeup ones but still easy to apply. Also got the 'Awesome Double Flick Thick and Thin' which is a felt-tip pen, one side with thin pointed tip and the other one a bit more round. Then I got two lipstick/pens from I ♡Makeup in colour 'Sunday Girl' that is bright hot pink/fuscia and both this and the orange one 'Atomic' are matte and long lasting. The are easy to apply and I really like them. So there is my haul and a few thoughts on the products. Hope you enjoyed reading this, have a nice weekend and see you again soon. Let me know if there is anything you like to see more of. Like 'Face of the day' or a 'Get ready with me' or just a simple eye look.